Aryabhatta was the first to explain how the Lunar Eclipse and the Solar Eclipse happened. He says that the Moon and planets simply shine by reflected sunlight. 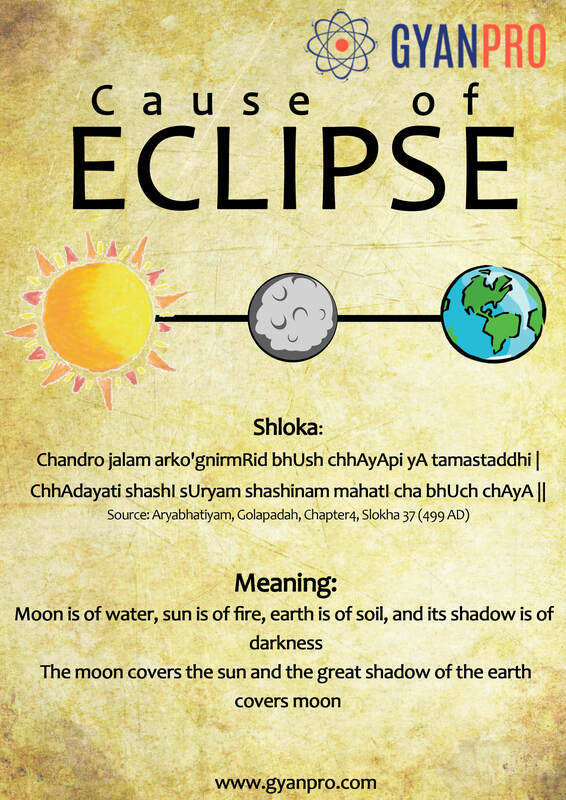 Earlier it was assumed that the eclipse was caused by Rahu and Ketu, but Aryabhatta explains eclipses in terms of shadows cast by and falling on Earth. The lunar eclipse occurs when the moon comes under the Earth’s shadow. Solar eclipse occurs when moon passes between sun and earth and partially or fully covers the sun. Long ago there was a war between Devatas (God) and Asuras(Demons).The Devatas almost losing in the war, sought help from Lord Bhrama. Lord Bhrama asked them to churn the ocean. As a consequence they would obtain Amrit(Necter) which when consumed would make them powerful and immortal and defeat the Asuras. Churning of ocean was a big job hence the Devatas sought help from Asuras. The King of Snakes Vasuki to become the rope, Mandrachal hill was to be become a hinge, in the form of Tortoise Lord Vishnu became the base and the churning started. The Devas held the tail of the serpent and the Asuras held the head of serpent. Various things came out during the churning of the ocean. Initially there was a pot of Vish(Poison) that came out and created a mayhem in the three worlds. Lord Shiva came up and offered to drink the poison to save the world, but he did not let the poison to go beyond his neck which become blue color, hence he’s called Neelkant(One with Blue Neck). At last Dhanvantri came out with the pot of Amrit and immediately there was chaos among Devas and Asuras. Seeing this, Lord Vishnu took the form Mohini (a beautiful dancer) and distracted both Devas and Asuras and offered to help them distribute the Amrit. Mohini made Devas and Asuras sit in two separate rows. Mohini started distributing the Amrit to the Devas and one of the Asura saw through her trick. The Asura disguised himself and sat with the Devas. This act of disguise was seen by Sun and the Moon who was sitting behind him, informed Mohini about the Asura.